Hi everyone. I have a different kind of card to share with you today for the current challenge at ATS&M (#116 - Anything Goes). I've made another vintage style card, this time using a beautiful image from STAMPloration's Bloom Sketches stamp set. Just a reminder that the current challenge over at Mixed Media Card Challenge (#4 - Vintage with optional element of key) is running until Oct. 25th and I hope you'll join us there as well. My friend Nonni mentioned that STAMPlorations has an Anything Goes challenge right now, so I'm linking up there too! :) Thanks Nonni!! Awesome experiment gone amazingly well :) Love the effect, Loll! Such a rich, wonderful look! What an amazing card Loll, it looks like a tainted glass work to me! It can be framed and used as a decorative, the little charm is a great addition. I adore this cracked look and it really worked out how you wanted, it looks stunning..you know it kind of reminds me of the look of paintings you see in old churches. If you had a religious stamp or a sort of vintage stamp this technique would make it look like an old painting.....listen to me! Just an idea that came to me looking at the amazing card! Loll, been away for a couple of weeks with no internet so just catching up. What a beautiful card. I really really love this look, so very eye catching. Beautiful vintage card Loll! 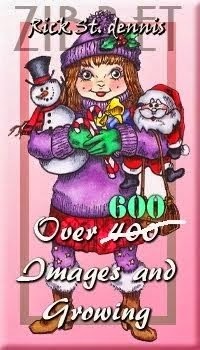 Brings back memories-my mother saved many, many cards over many years. Treasures that had become very fragile. Loll, I love the way you're stretching your talents in different directions! This is so beautiful and so perfectly done. I'd love to try the crackle stuff. What a gorgeous effect Loll. Not surprised you were a bit wary of distressing the crackles but it's turned out beautifully. 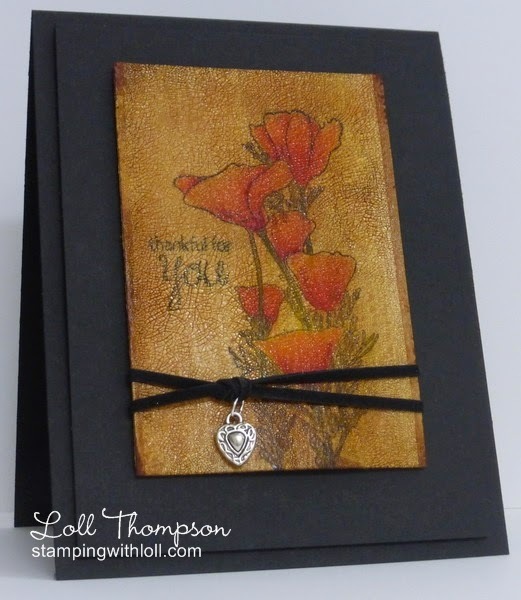 Love that crackle Loll - what a great look it gives to your beautful card! It would have terrified me to cover that beautiful watercolored card! But it really paid off! What a wonderful technique! This is beautiful, Loll! I love the crackle finish. Absolutely super! I really like the crackle finish - it does give a fabulous vintage look. Such a sweet little charm too! You are so brave Loll, what a scary thing to do after painting your beautiful flowers...yikes!!! But it has turned out a real success, I love the finish. Stunning effects, Loll. So fabulous on the black card and the little heart is a lovely touch. Wow Loll - that crackle panel is so rich and gorgeous - amazing work!! This is such a GORGEOUS card, Loll! 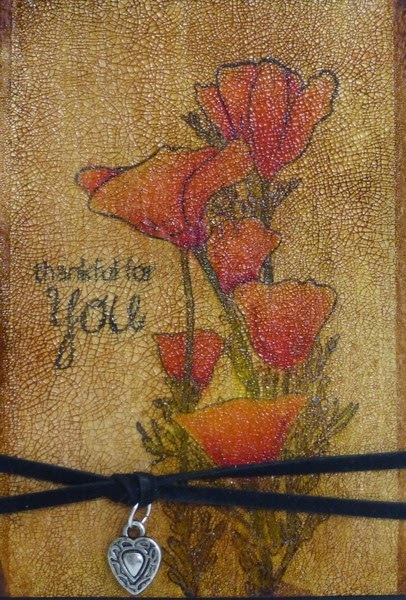 I had no idea that you could achieve this effect with Clear Rock Candy Crackle and Distress Ink...wow! Your risk really paid off with an amazing result and stunning card! So glad you experimented with this, it was certainly worth the stress! What a totally beautiful effect and it really does have a vintage feel. Fab! Oh my stunning results, I have recently bought the crackle paste :) you have inspired me to use it right away! Gorgeous card! I love this cracked look! I never try this technique before. I will try it! Amazing card, Loll! You've inspired me to give my crackle paints another try...I've relegated them to my "frustrating supplies" pile and they've been there for over a year because I can never get them to look the way I wanted them to look! Oh Loll, what a beautiful old picture! I love drawing cracks which makes this card very vintage. I love this card!